June 2001 marked the 25th anniversary of Combine Harvester reaching #1 in the UK singles charts. To mark the occasion - and on the back of good sales figures of the Finest 'Arvest compilation album released in July 2000 - EMI Gold released the 2001 remix of this massive hit. The track was remixed by a dynamic young team of writers/producers Humpafunk for Rareboy Productions Ltd. The result was well worth the effort. 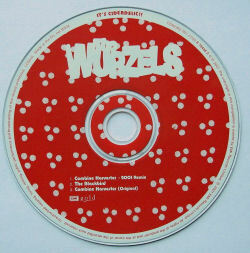 The single marked The Wurzels return to the UK singles charts for the first time since the summer of 1977. Although the single only stayed in the Top 60 for two weeks, peaking at #39 - it was a major breakthrough, and the band has returned to the charts several times since. The song remains a finale to the band's live shows to this day. See EMI press release and Zider Ed's Wurzelmania! marketing below. 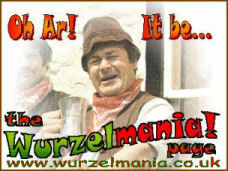 Of especially interest is the Wurzelmania! name check on the demo disc! The band line-up is given as Pete Budd, Tommy Banner, Dave Wintour and John Morgan (which was The Wurzels line-up at the time of release). This is somewhat missing the point that it is Tony Baylis playing on all three tracks along with Pete and Tommy. Tony's picture does appear on the demo of the single, but the release only shows Tommy and Pete (and half a horse) which does appear to be a bit of a slight to old Gaffer Baylis. Note that the release date given on this page is 30th July, whereas the date on the demo disc is stated as 11th June. Although I would normally go with the date on the demo disc, it was Paul Gunningham who used the 30th July date. As he was very involved with the release of the single, I wonder if it was delayed from the initially planned release date of 11th June to the 30th July. if anyone knows the answer, please let us know. "June of this year marks the 25th anniversary of Combine Harvester (Brand New Key) rocketing to No. 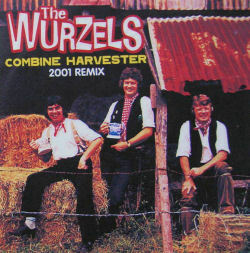 1 in the UK singles charts, performed by those loveable country-bumpkin types - The Wurzels! To mark the occasion EMI Gold are proud to announce the 2001 remix of this massive hit! The concept for the remix came about as a result of the huge demand for the band's Finest 'Arvest hits compilation released in July last year. Tens of thousands of albums have flown off the shelves since then, even managing to outsell the Spice Girls new Forever album in the West Country! The track has been remixed by a dynamic young team of writers/producers who have been building a strong reputation working on tracks by artists as diverse as Billie, The Cuban Boys and Jerry Springer(!). Everyone over the age of 20 remembers The Wurzels' million-selling single Combine Harvester, which is recollected with a fondness that few novelty recordings attain. The remixed version of this classic has all the hallmarks of a modern summer anthem, coming complete with massive beats, a rumble-tastic fuzz bass and The Wurzels' trade-mark sense of humour. The band continues to play regularly to packed venues nationwide. Original members Pete Budd and Tommy Banner have been joined by 'new boys' John Morgan and Dave Winter, and the lads are currently embarking on their latest UK tour! To top it off EMI are making a 50p contribution from every copy of the single sold to the Farm Aid charity, an issue obviously very close to the band's heart." The Wurzels' forthcoming new single has already generated a lot of interest in the media, both in the local press in the West Country and even the national media - it was mentioned in a small article in the Sun on 3rd May. In addition it has already been getting airplay on both local and national radio - including BBC local stations well outside the band's West Country heartland, London's Capital Radio and it has even been aired on BBC Radio One (on the Sarah Cox peak-time breakfast show) - something The Wurzels and their fans would never have dreamed of a couple of years ago! 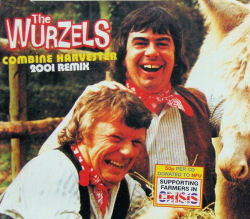 Help Get The Wurzels Back To Number One! ORDER THE NEW SINGLE ONLINE IN ADVANCE FROM HMV! Just click here! Don't forget - 50p of the profit from each CD goes to Farm Aid - the charity which helps the farmers suffering from the effects of the recent terrible foot & mouth epidemic - buy the record and help a good cause at the same time! Watch the Wurzelmania! page for updates on the new single - if anyone has any news of "sightings" of The Wurzels or the new single in the media, please Don't Tell 'Ee, Tell I - don't just assume we've seen it! FRIDAY 13th JULY - 1.30p.m. 240 Great Portland Street, London W1. 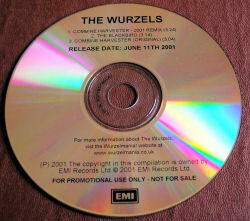 "THE WURZELS HEAD FOR LONDON - You've heard of Garage music - now the latest craze of 2001 has arrived - Cowshed music! Yes, it's true and they�re doin a one off Live Appearance at L'il Backyard Club, Fitz & Firkin, 240 Great Portland Street, London W1. Tel (020) 7580 8881. Contact Phil Catchpole. The Band are comin to Town on a gert big Combine Harvester twenty-five years after their number one smash of the same name. 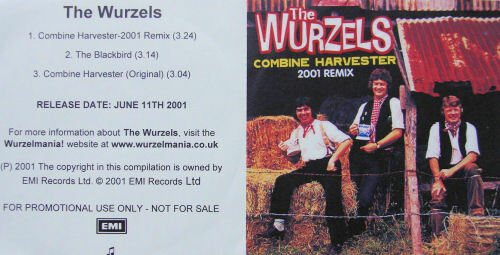 The Wurzels are heading for the top again with their 2001 Remix of the song, out on 30th July. The single has already generated unprecedented interest not only from clubbers and DJs, but also in the national press, on TV and radio - even BBC Radio 1 have been playing it! The Bands Record Company EMI are giving 50p from the sale of each CD will go to the N.F.U. Farmers in Crisis charity, which helps farmers suffering hardship as a result of the devastating foot and mouth epidemic. So do yourselves a favour and help the farmers at the same time - order your copy NOW and help get The Wurzels back to Number One! Unfortunately you can't buy it in Woolies at present, the reason is because they only sell records that are definite top 20 hits not even Charity ones are taken unless there are advance orders SO PLEASE ORDER IT NOW FROM WOOLWORTHS.